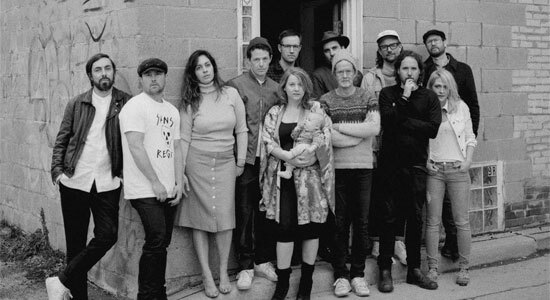 Broken Social Scene albums have never been about raising the profiles of the group’s dozen-plus members. Though guitarist Kevin Drew and bassist Brendan Canning serve as de facto leaders, BSS thrives on collaborations that yield results greater than the sum of their parts. With several members boasting their own celebrated careers, each assembly of BSS can end up feeling like a family reunion, inside jokes and all. Hug Of Thunder features just about all of the marquee names associated with BSS (Feist, Metric’s Emily Haines, Stars’ Amy Millan), but they share the spotlight with a handful of new recruits. Singer Ariel Engle is the most prominent addition, taking the reins on highlights “Stay Happy” and “Gonna Get Better.” Haines shines on the breathless “Protest Song,” and under Feist’s guidance, the title track is one of the band’s best. With so many talented cooks contributing to Hug Of Thunder, not to mention the significant gap between its release and its predecessor (2010’s Forgiveness Rock Record), the retreads of familiar sonic ground are a bit disappointing. As fun as Drew’s “Halfway Home” is, it’s a total ringer for the band’s 2005 breakout, “7/4 (Shoreline).” The muscular arrangements and horn flares elevate “Vanity Pail Kids” and “Gonna Get Better” much in the same way they did for the standouts on Forgiveness Rock Record. If it’s been a minute since you’ve spent time with BSS, Hug Of Thunder could be a revelation. Otherwise, you’ll just have to settle for it being a very good album.